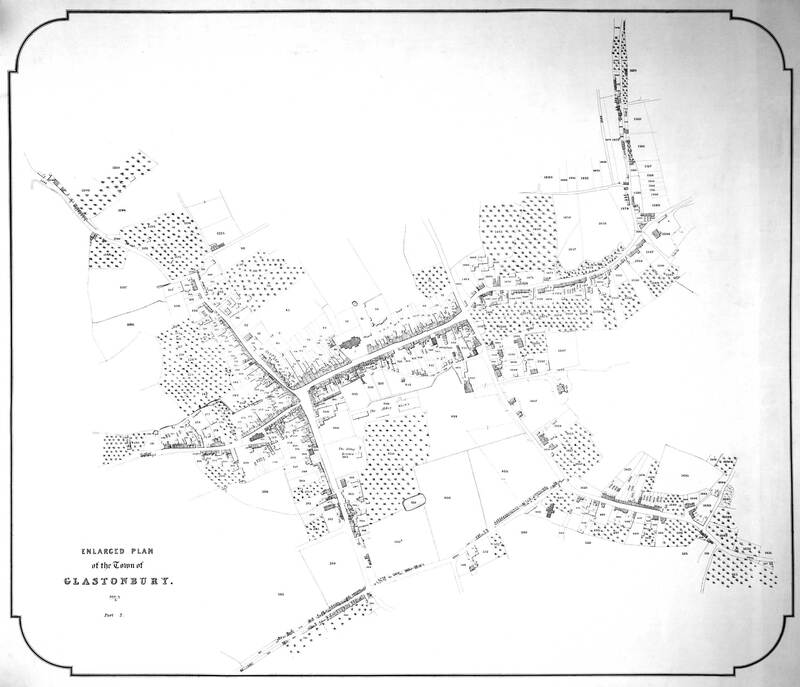 1842, Part 2, Enlarged Plan of the Town of Glastonbury by Thomas Hawkes, Surveyor, Williton. With the exception of a few grand Georgian and Regency houses for the more well-off the town's buildings were still only occupying the medieval sites. The increasing working population was being housed in very small insanitary cottages; see the thirteen dwellings and the Rose and Crown stables in Hanover Square behind the High Street at the end of Silver Street (388-403). The lawyer John Fry Reeves had bought most of the Abbey enclosure in 1825 and has turned it into the 'pleasure grounds' for his new Priory House (the Abbey House, 448). This included excavating a new pond (351) to the west of the abbey fish ponds. When he left the town his son used his mother's surname of Porch and his son later moved to Edgarley. The Baltonsborough James Austin returned from Australia to Somerset House and later moved to the Abbey House in 1862. In Chilkwell Street John James Rocke had built Chalice Hill House (1607), Stephen Holman his lawyers' office (1606) and Thomas Pickford Blenheim House (1616). At the junction of Chilkwell Street and Bere Lane were two gates, the terminus of the Shepton turnpike; the gates were later moved along Chilkwell Street to the toll house (507) opposite the re-named Tor Inn (1645) with the baths in its grounds.